PECO (Pakistan Electronic Crimes Ordinance) was promulgated by then President Pervez Musharraf in 2007. Since it was an ordinance, it lapsed in 2009. PECO was criticized for its over broad language in particular and, when an attempt was made to enact it as a law, it was opposed by industry and members of opposition in parliament alike. Collective pressure resulted in the withdrawal of the proposed legislation from the floor of the assembly by then Prime Minister, Yusuf Raza Gilani. Following its withdrawal from the floor of the assembly, industry associations ISPAK (Internet Service Providers Association) and P@SHA (Pakistan Software Houses Association), with a committee of parliamentarians, began to draft a new bill. In 2014, ISPAK, P@SHA and the Ministry of Information Technology & Telecommunications (MOITT), after consultations, agreed to an industry stakeholder draft (no civil society organization or members were privy to this process, however). This was then sent to the Cabinet Division. In February 2015, that industry stakeholder draft emerged from the Cabinet Division with modifications. Bolo Bhi learnt the bill was being presented before the National Assembly’s Standing Committee on Information Technology and Telecommunications for approval and we shared our reservations on it (see: Pakistan’s Cybercrime Bill 2015: Speak Now or Forever Hold Your Breath). Our stance was that even though there is a need for a cybercrime bill, the bill in its current form should not be passed in haste (see our press release here: Cybercrime Bill Must Not Be Approved In Its Current Form). Syed Ali Raza Abidi, Member National Assembly (MNA) Muttahida Quami Movement (MQM), and member of the National Assembly’s Standing Committee on IT, played a pivotal role in ensuring that the comments were placed before the parliamentary committee. The NA Standing Committee on IT, after receiving comments and facing considerable opposition to the passage of the bill by some committee members, formed a subcommittee to revise the bill in light of the concerns. Following this, Bolo Bhi held consultations with members of industry, civil society, and technical and legal experts. Journalists were also invited to these sessions. One of these sessions was also attended by Syed Ali Raza Abidi. The subcommittee, though originally composed of four members of the Standing Committee, including members of opposition, soon turned into a government-led committee that began reviewing and modifying the draft. These meetings were held at the Ministry of IT, and members of opposition were not privy to this process. This was expressed by Shazia Marri (MNA,Pakistan Peoples Party) and Senator Mushahid Hussain (Pakistan Muslim League-Q) in the presence of Minister of State for IT & Telecom, Anusha Rahman, on Hamid Mir’s show Capital Talk, saying the bill had not been shared with them. Bolo Bhi obtained a leaked version of the government’s modified draft bill and, in April, we went public with the draft bill and our analysis, comparing it to the version that came out of the Cabinet Division, also indicating changes that had been made to the industry version before it. Read here: What’s Brewing: Pakistan Government’s Proposed Cybercrime Law and our analysis of the bill. 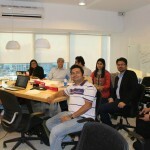 On April 10, we held our first public event at The Second Floor (T2F) in Karachi, where we presented and discussed the implications of the cybercrime bill with members of the audience. Audience members also included former and serving officers of the Federal Investigation Agency’s (FIA) NR3C (National Response Centre for Cyber Crime) wing. The presentation can be viewed here: Proposed Cybercrime Law – Reason To Worry. 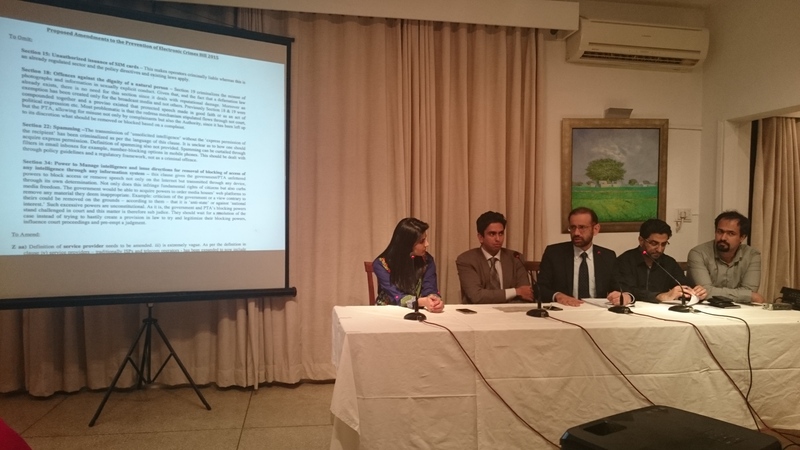 On April 15, under the banner of the Joint Action Committee (JAC), industry associations Internet Service Providers Association of Pakistan (ISPAK) and Pakistan Software Houses Association (P@SHA), and Bolo Bhi held a joint press conference at the National Press Club in Islamabad to raise concerns about the proposed law. The press conference was addressed by Wahaj us Siraj (Convenor ISPAK), Farieha Aziz (Director Bolo Bhi), Syed Ahmad (Spokesperson P@SHA), Khwaja Saad Saleem (Vice President ISPAK) and Tahira Abdullah (human rights activist). 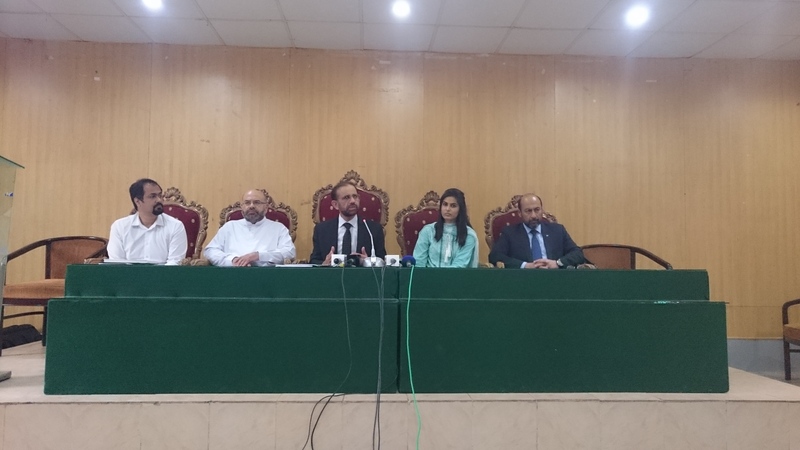 Details here: Press Conference: Joint Action Committee on Cyber Crime Bill 2015. The next day, on April 16, the National Assembly’s Standing Committee on IT, chaired by Captain Mohammad Safdar, approved The Prevention of Electronic Crimes Bill 2015 – a version prepared by the government-led committee. This was a modified version of the leaked draft Bolo Bhi had managed to obtain earlier. While the order and structure of sections had been altered, and there were some content additions, most of the problematic provisions and reservations vis a vis the previous version raised at the press conference, remained. These included clauses on Spamming, Spoofing, Cyber Stalking, Cyber Terrorism, Natural Dignity of a Person, Powers to manage intelligence, to name a few. Read here our analysis of the bill. 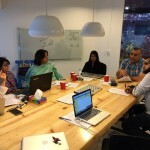 Bolo Bhi held an awareness-raising session on the version of the bill approved by the NA Standing Committee on IT on April 17, at The Nest i/o in Karachi. 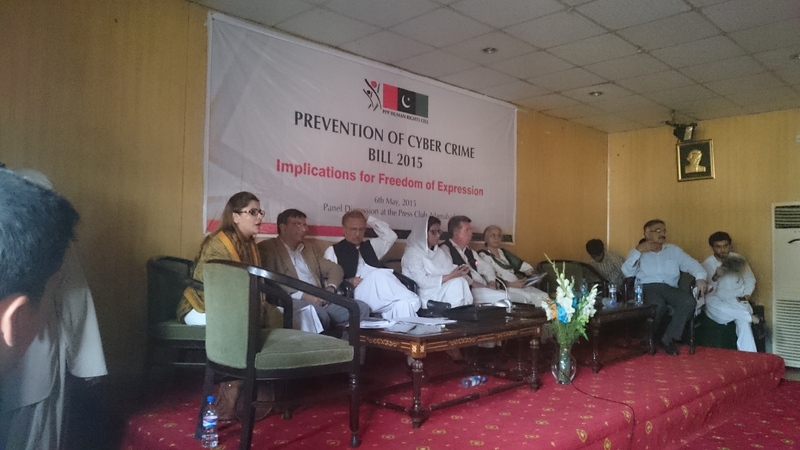 See: Bolo Bhi’s Meeting and Our Call-To-Action On Cybercrime Bill. See news coverage here: Voicing concern: Cyber crime bill continues to attract criticism. 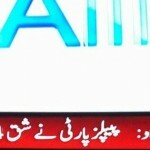 The Pakistan People’s Party (PPP) Human Rights Cell published a press release on April 19, in which PPP Human Rights Cell Central Coordinator and Member National Assembly, Dr Nafisa Shah, expressed concerns about the hasty approval of the proposed bill by Standing Committee without input and feedback from any stakeholders i.e. legislators in opposition, industry professionals, civil society organizations and citizens. On April 20, local and international rights groups including Human Rights Watch (HRW), Digital Rights Foundation (DRF), Privacy International (PI), Bytes for All (B4A), and Bolo Bhi were among the signatories to a statement drawing attention to the inadequate protection of internet users in the proposed cybercrime bill. See statement here: Pakistan Cyber Crime Bill Threatens Rights. 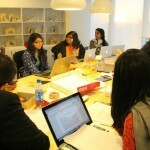 On April 23, an open session to discuss the bill was hosted by Kuch Khaas in Islamabad. Lawyers, industry professionals, citizens gathered to discuss the major concerns about the bill, and members of the Joint Action Committee joined by two independent lawyers, addressed members of the audience, insisting the bill be sent back to the NA Standing Committee for review and input of stakeholders. Here too, officials from NR3C joined the discussion – though in an unofficial capacity, as they remarked. 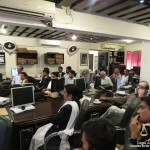 Journalists concerned about the possible impact on media freedom also hosted an interactive session on the cybercrime bill organized at the National Press Club in Islamabad on April 26. They were joined by Usama Khilji of Bolo Bhi, Tahir Malik, Professor at National University of Modern Languages, Shaharyar Khan, President National Press Club, and Syed Ahmad, a representative of Pakistan Software Houses Association. 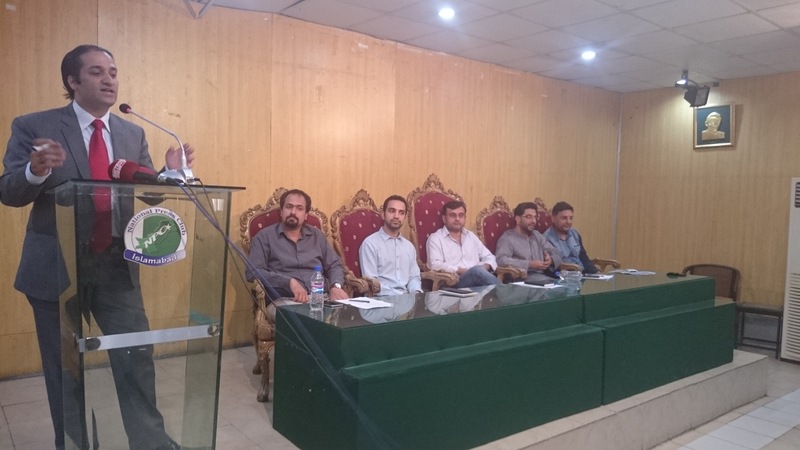 A dialogue was held at the Karachi Press Club on April 27 at the end of which the Prevention of Electronic Crimes Bill 2015, in its present form, was unanimously rejected and participants voiced their concerns regarding its enactment. They contended such a harsh law would flout fundamental rights and freedom of speech. 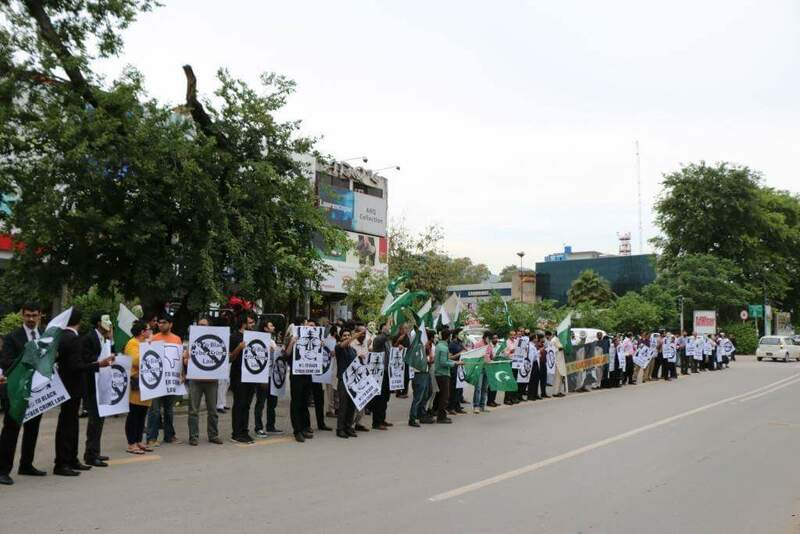 On April 30, a large number of IT professionals, human rights activists, students, and concerned citizens gathered at F-6 Markaz in Islamabad to protest against the proposed cybercrime bill. Syed Ahmed of P@SHA addresses demonstrators. Concerned citizens peacefully demonstrate by the side of a road. 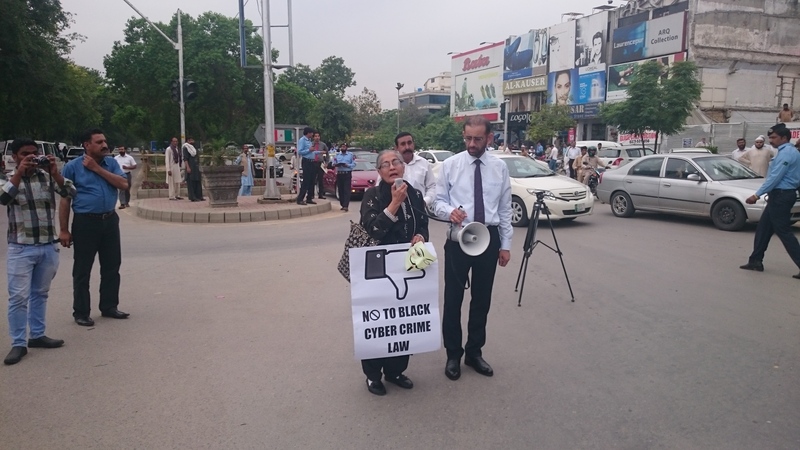 Human rights activist Tahira Abdullah addresses demonstrators. Wahaj us Siraj of ISPAK to her right. 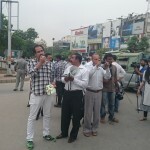 Usama Khilji of Bolo Bhi speaks to the media at the demonstration. On May 3, the National Assembly’s Standing Committee on IT invited public input on the bill, in writing via email, within seven days. 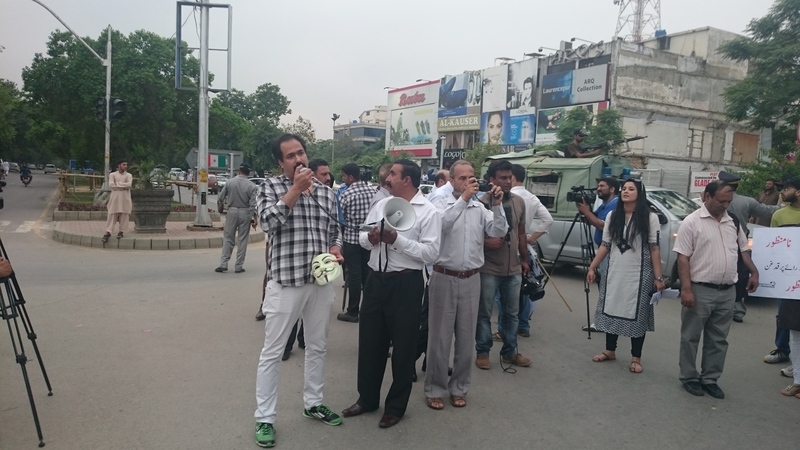 On the same day, a demonstration was organized by the Pakistan Federal Union of Journalists (PFUJ) on World Press Freedom Day (May 3). 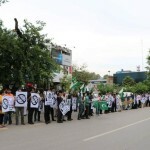 Journalists took to the streets and warned that if the government tried to muzzle the media, they would stage large-scale demonstrations across the country. 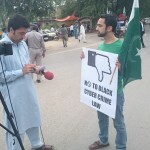 The PPP Human Rights Cell followed up their press release by holding a public dialogue on the bill titled ‘Cyber Crime Bill 2015 — its implication on freedom of expression,’ at the Islamabad Press Club on May 6. The first panel comprised representatives from industry and civil society, as well as lawyers, academics and media practitioners. The panelists included: Wahaj us Siraj (ISPAK), Jehan Ara (P@SHA), Farieha Aziz (Bolo Bhi), Babar Sattar (lawyer), Talat Hussain (TV anchor) and Professor Tahir Malik (academia). The second panel, moderated by PPP MNA Nafisa Shah, comprised the following: Shazia Marri (MNA, PPP), Dr Arif Alvi (MNA, PTI), Afrasiab Khattak (former Senator, ANP), Senator Karim Khwaja (PPP) and Khawar Mumtaz (Chairperson, National Commission on the Status of Women).The event was attended by a large number of university students and legislators. The dialogue was widely covered on social media, especially Twitter. View our Storify here. On May 7, in response to the NA Standing Committee’s call for public input on the bill, the Joint Action Committee submitted consolidated comments and a request for a public hearing on the bill. This was endorsed and jointly submitted by 10 organizations (see: PECB2015: Consolidated Comments & Request for Public Hearing Submitted). Hard copies of the consolidated comments and request for a public hearing were also posted to Captain Mohammad Safdar, Chairman NA Standing Committee on IT and Telecommunications; Speaker National Assembly, Sardar Ayaz Sadiq; Leader of Opposition National Assembly Syed Khurshid Ahmed Shah; and Chairman Senate, Mian Raza Rabbani. The session was chaired by IPS Chairman, Professor Khurshid Ahmad, while the keynote speakers included Major (R) Tahir Iqbal, MNA Pakistan Muslim League-N (PML-N) and member NA Standing Committee on IT, and Wahaj us Siraj, Convenor ISPAK. At this session, experts unanimously agreed that there was a need to adopt a more balanced, comprehensive and technically sound approach in finalizing the proposed legislation. 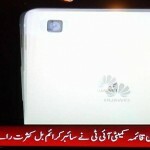 What was supposed to be a public hearing on May 18 and then on May 20 on the Prevention of Electronic Crimes Bill 2015, turned into a NA Standing Committee meeting instead, due to objections raised by some members that the committee as a whole, and not the Chairman, could call a public hearing. At this meeting, Minister of State for IT & Telecom, Anusha Rahman, remarked ‘elements are making a hue and cry so that no laws against cyber crimes could be enacted in the country.’ This was strongly refuted by the Joint Action Committee in a statement (see: Citizens and Industry Refute IT Minister’s Statements & Demand Proper Public Hearing). A public hearing was finally scheduled for Friday, May 22, 2015 – with hardly two days notice. This, too, came after much agitation by some members of the committee. Syed Ali Raza Abidi (MNA, MQM) took the initiative to follow up with the Chairman of the committee. Shazia Marri (MNA, PPP) submitted her own request for a public hearing to the Chairman, and found support of other colleagues namely Syed Ali Raza Abidi (MQM), Khusro Bakhtyar (PML-N) and Amjad Ali Khan (PTI), who were also in favour of a public hearing. The committee ultimately decided to proceed with the hearing, however decided to limit the attendance to seven invitees who were to appear before a committee of 20 members. This list too was later altered just a day before to exclude many of the seven invitees. Members of the Joint Action Committee were of the view that this could be termed a meeting but not a public hearing. The formation of a subcommittee was a good step forward. This meant the bill would not be rushed through and provide everyone with the opportunity to raise concerns and hopefully have them addressed as well. On July 24, Barrister Zafarullah mentioned on Bay Laag with Ejaz Haider that the government would be reaching out to the sub-committee for a consultation on PECB15. Though the instructions issued to Ministry of Information Technology and Telecommunications (MoITT) at the meeting on May 22 were to hold a meeting with members of the JAC, no meeting was ever initiated or held. The Joint Action Committee (JAC) released a statement on August 21 on the deadlock with the government and petitioned Senate through its online public portal to conduct a hearing on the bill. Read the petition here. On September 17, 2015, in a surprise move, the National Assembly Standing Committee on IT passed the Prevention of Electronic Crimes Bill 2015 with a majority vote. PPP MNAs Shazia Marri and Nauman Islam Sheikh opposed the bill, and PML-N MNA Awais Ahmad Khan Leghari objected against committee members not receiving a copy of the bill to read before it was passed. Awais Leghari also claimed that up to 500 people had provided their input on PECB15 at a public hearing; however, the only meeting held on PECB15 was in May 2015 at Parliament House, Islamabad, attended by selected people. No meeting/hearing has been called on the bill to date that’s been open to public. On October 6, 2015, Pakistan Institute for Parliamentary Services (PIPS) held a Public Hearing with Standing Committees of Senate and National Assembly on Information Technology, on the proposed Prevention of Cyber Crimes Bill. Officers from concerned Ministries, Academicians Print/Electronic Media and Members of Civil Society were invited to the event, to provide lawmakers with necessary input on this legislation. Legislators who attended included Senators Aitzaz Ahsan, Farhatullah Babar, Taj Haider, Mushahid Hussain Syed, Hasil Bizenjo, Shahi Syed, Dr Karim Khwaja and Shazia Marri. Director NR3C, Sabir Ahmed and Deputy Director NR3C Aun Abbas and Member Legal, Ameena Sohail, Ministry of IT, were also there. 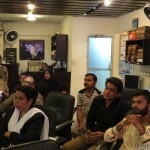 Members of rights groups, industry organizations, IT experts and journalists also attended. 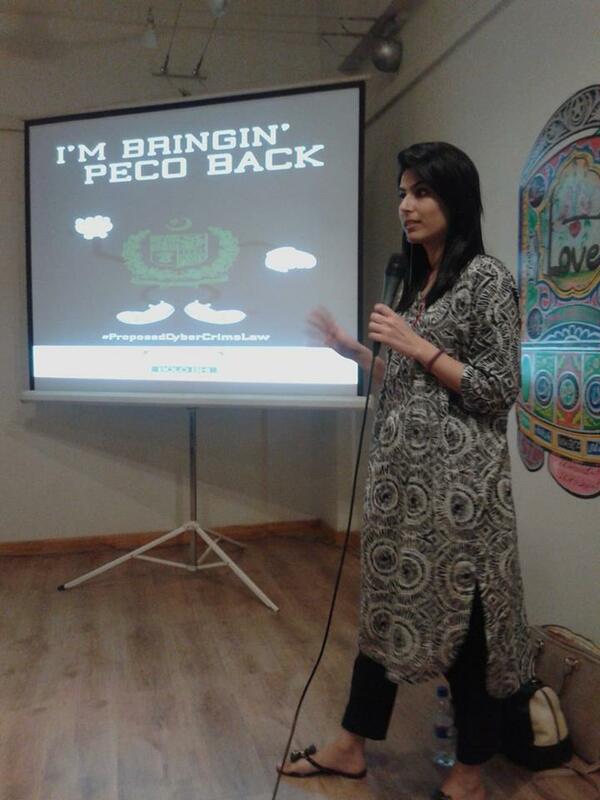 On October 6, 2015, PECB15 was the focus of Meher Abbasi’s show NewsEye. 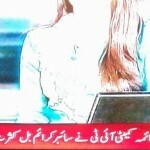 Panelists on the show were PPP MNA Shazia Marri, journalist Sadaf Baig, and Barrister Zafarullah. Problematic clauses of the bill such as Section 34 were also discussed. Also on October 6, 2015, Director Bolo Bhi Farieha Aziz appeared on Matiullah Jan’s show Apna Apna Gireban. Other panelists were Dr. Amir Mateen and Zahid Jamil. 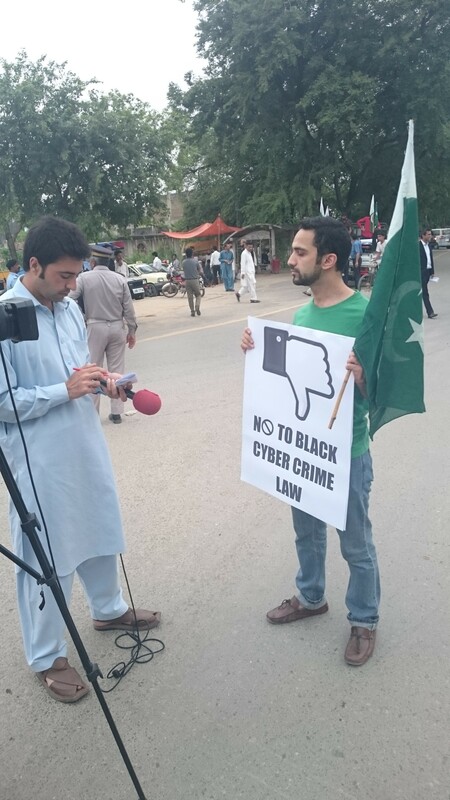 The show discussed PECB including the punishments proscribed under the bill, as well as the YouTube ban. Also on October 7, 2015, a press conference was held at Islamabad Press Club to voice concerns and oppose the bulldozing of PECB15. 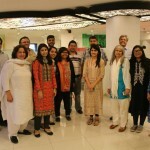 Groups advocating for free speech and digital rights attended the conference, including Digital Rights Foundation (DRF), Human Rights Commission of Pakistan, Blue Veins, the Pakhtunkhwa Civil Society Network, the Tribal NGOs Consortium, Institute for Research, Advocacy and Development (IRADA), Civic Action Resources and Pakistan For All. 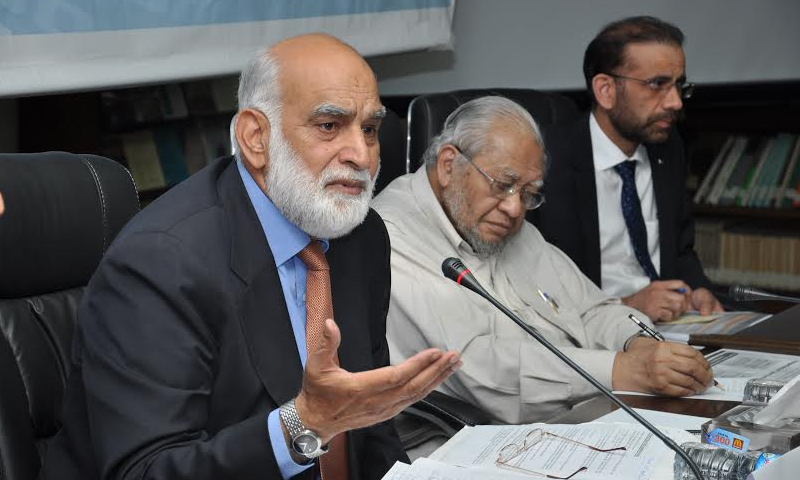 The Shaikh Ahmad Hassan School of Law (SAHSOL) organised a Round Table Conference on October 8, 2015 on ‘Prevention of Electronic Crimes Bill, 2015.’ The Conference entailed an interactive discussion on the content and possible legal, socio-political and economic impact of the Bill. The Round Table was attended by eminent activists including I. A. Rehman (HRCP), Farieha Aziz (Bolo Bhi), members of the Digital Rights Foundation and prominent legal practitioners, such as Asad Jamal and Saroop Ijaz. The conference included a representation on the FIA by Deputy Director Cyber Crimes Wing, Syed Shahid Hassan. Other panelists included: Adnan Ahmad, Ali Kamran, Anoosha Shaigan, Gul Bukhari, Haris Ramzan, Imran Zia, Khurram Zafar, Maria Farooq, Nabiha Meher Shaikh, Nighat Dad, Noor Bano, and Saqib Jillani. 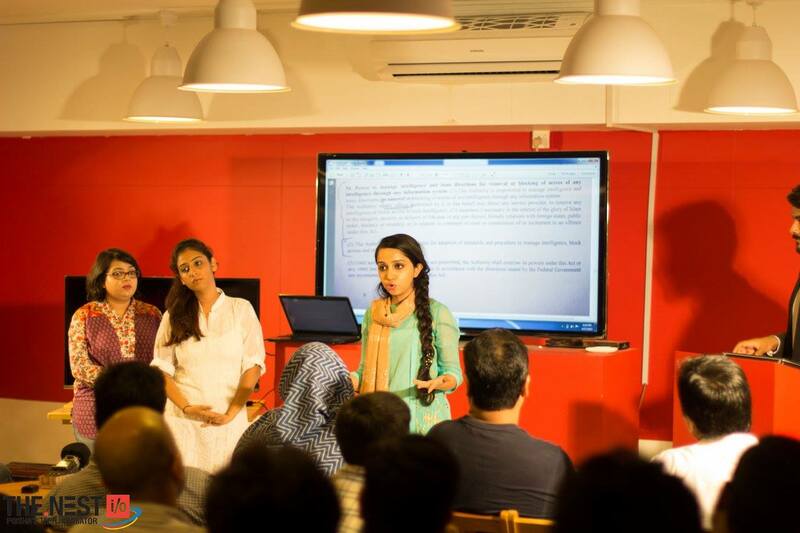 On October 14, Farieha Aziz and Madiha Latif held an interactive session with students of Karachi Institute of Technology and Entrepreneurship(KITE). The students learned about the cybercrime bill as well as YouTube Ban, and shared their opinions on topics such as online regulation. 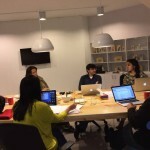 They discussed censorship as well as political activism, and social issues linked to censorship and Internet regulation. 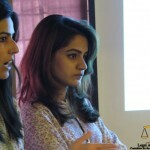 On October 15, 2015, Farieha Aziz and Hija Kamran represented Bolo Bhi during a session on PECB for Legal Aid Office (LAO). The team at LAO was briefed on what the cybercrime bill was, why amendments were needed, and which clauses were problematic and why. On October 16, 2015, Farieha Aziz, director Bolo Bhi appeared on the show Yeh Hai Zindagi, Dawn News, to discuss the cybercrime bill and the dangers of implementing the bill. Watch from the 32:15 mark. However, on November 2, 2015, the Ministry of IT denied this news, and said that the bill was now “property of Parliament and only the legislature could decide its fate.” This is a bogus argument because when the predecessor of PECB15 i.e. PECO was close to being re-enacted into law some years ago, public pressure ultimately led then-PM Yusuf Raza Gilani withdrawing it from the floor of the assembly. As a government bill, PECB can also be withdrawn; in fact, it has already once been driven back from the floor of the assembly to the Standing Committee of IT. On November 18, 2015, Capital TV anchor Shahzad Raza discussed the Supreme Court’s observations on Facebook as well as PECB15 on his show Awaam. Guests included Director Bolo Bhi Farieha Aziz, journalist Ansar Abbasi, and advocate Aliya Agha. On November 26, Capital TV’s show Capital Today, hosted by Murtaza Solangi, discussed the cybercrime bill with Farieha Aziz and journalist Gul Bokhari. Capital Today – 23 November, 2015 from Capital TV on Vimeo. 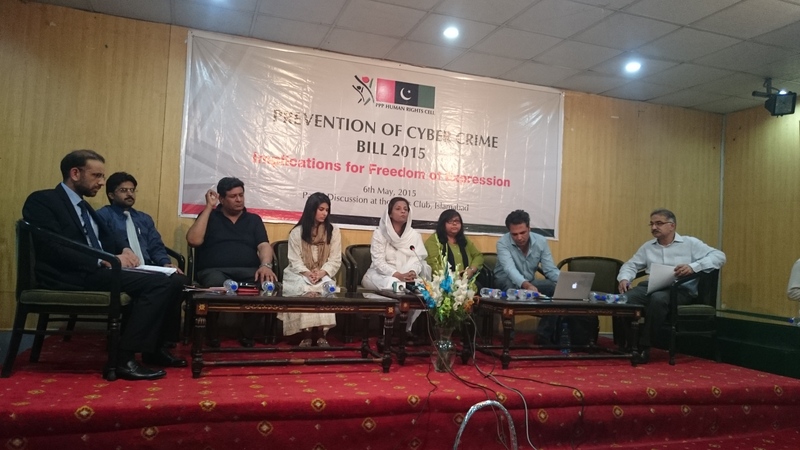 Also see Bolo Bhi’s aggregated Storify of the panel: Cybercrime Bill: Blessing or Curse? On November 30, BBC Urdu interviewed Farieha Aziz and Nighat Daad on PECB15. Listen to the interview here. To put this into a little bit of context, please see this post on Storify: Taking Stock: Blackberry’s Announcement to Exit Pakistan & Authorities Trying to Gain Backdoor Access to Servers It takes stock of Blackberry’s announcement to exit Pakistan; authorities trying to gain backdoor access, and what that means. This is also reviewed in the context of the proposed Prevention of Electronic Crimes Bill. Find also a discussion of company policies regarding government requests, and the concept of encryption and privacy. On December 2, the restriction on YouTube and the proposed cybercrime bill were discussed on Neo TV. Panelists included Senator Karim Khuwaja (PPP), Syed Ali Raza Abidi (MNA – MQM), Ramesh Kumar (MNA – PML-N), Sadaf Baig (MMFD), and Haroon (B4A). On December 6, Shahzada Irfan wrote about PECB for The News on Sunday(TNS). On December 7, journalist Huma Yusuf wrote an op-ed for Dawn regarding PECB, and the ramifications of Blackberry’s exit from Pakistan. On December 16, Geo TV aired a special transmission of Talat Hussain’s show Naya Pakistan, in which he discussed the cybercrime bill. Panelists included Director Bolo Bhi Farieha Aziz, analyst Mosharraf Zaidi, Ahmer Bilal Soofi, and Director Geo News Rana Jawad. Though included in the above report, also see this two pager which specifically lists the major concerns regarding privacy and expression, and how PECB will impact them. View here: PECB Major Concerns. On January 15, Bolo Bhi shared amendments filed by Shazia Marri (PPP), Syed Ali Raza Abidi and other MQM legislators, and Dr Arif Alvi (PTI), which can be viewed here: Amendments to PECB in National Assembly. On April 13, The Prevention of Electronic Crimes Bill was passed by the National Assembly. It now moves to the Senate where there will be a public debate on the bill, and will hopefully be amended. The bill was passed in the absence of 90% of the MNAs – only 30 members were present in the 342-member house. Read Tribune’s blog discussing the bill. The latest amendments in the bill were released in February this year, but approved version of the bill, however, has not been made publically available by the National Assembly. On April 14, Alina Shigri focused her show ‘The Other Side’ on the bill. Senior IT Experts Salman Ansari, Dr. Kamil Tarar, Tahir Chaudhry were present on the show to discuss how the bill will affect the general citizens. On April 15, Member PMLN Maiza Hameed and Digital Rights Foundation Director Nighat Dad appeared on Shadab Riaz and Mohammad Ahmad’s show Zanjeer-e-Adal on Capital TV to discuss the bill. On April 18, Nighat Dad was the guest on Khabar Kay Peechay Fawad Chaudhry Kay Sath airing on Neo TV where she highlighted the dangers that lie ahead if the Pakistani Senate passes the Prevention of Electronic Crimes Bill 2015 in Pakistan. Later that day, Farieha Aziz was on Kamran Khan show Dunya Kamran Khan Kay Sath on Dunya News to speak on cybercrime bill. Watch from 47:38 mark. 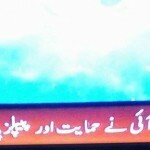 On April 20, Prevention of Electronic Crimes Bill was discussed on Capital Today on Capital TV. Murtaza Solangi in conversation with Saroop Ijaz, Gul Bukhari, Sadaf Khan and Farieha Aziz. On April 24, Shahzada Irfan Ahmed wrote on cybercrime bill for his blog ‘The threat to cyber law’ on The News on Sunday. Bilal Memon wrote an analysis for Express Tribune ‘Prevention of Electronic Crimes Bill: Has Pakistan Managed to draw the line?’ on April 25 where he quoted Farieha Aziz of Bolo Bhi along with Awais Leghari (PMLN), Saghir Anwar Wattooi (Director PR – IT Ministry), Barrister Zahid Jamil, and Ameen Suhail (Member Legal – IT Ministry). 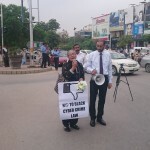 On May 3, Kunwar Khuldune Shahid wrote a detailed analysis of Pakistan’s cybersecurity ‘Cybersecurity: Work in Progress’ and quoted Farieha Aziz, Nighat Daad, Gul Bukhari and Aleena Alavi. On May 17, in collaboration with Digital Rights Foundation, Bolo Bhi held a consultation on the cybercrime bill with legislators. This was attended by representatives of rights groups, rights defenders, lawyers, journalists and legislators namely Farhatullah Babar (PPP), Afrasiab Khattak (ANP), Ali Raza Abidi (MQM), Rubina Khalid (PPP) and Shahi Syed (ANP). Bolo Bhi looked into the commitments by those in opposition, to stop this bill from passing in its current form, in the Senate. Concerns regarding the process and content of the bill were put before the legislators. It was also flagged that the bill was on the Senate’s agenda for that afternoon. Legislators gave their commitment to stop any attempt to bulldoze the bill through the Senate. Legislators from all three parties ensured they spoke to members of their parties and despite the boycott otherwise, attended the Senate session to ensure the bill was sent to the Senate’s Standing Committee on IT for further review. The bill, which was on the agenda on May 17 in the Senate, has been referred to the Senate’s Standing Committee on IT with the direction that members of the human rights committee of the Senate also be invited to it and all public petitions made to the Senate by concerned citizens also be taken up in the meeting. Moreover, at the consultation, Chairman Standing Committee on IT Senate, Shahi Syed, also assured a public hearing would be held and input everyone will be taken on board. See the analysis presented by Bolo Bhi at the consultation, available on Dawn here. See The Nation’s coverage of the session here. Watch a small report on put together by Digital Rights Foundation based on the session organized by DRF and Bolo Bhi on cyber crime bill with senators.